Health Message: Active children and adults, and people with lung disease, such as asthma, should reduce prolonged or heavy exertion outdoors. The wave of low pressure that brought cloud cover and breezes to the Valley yesterday has moved on to the east, and high pressure will begin to takes its place today. Then by tomorrow (Thursday), the high pressure will be well situated over the Southwest. The main concern of this air quality forecast will be increasing ozone today and tomorrow because of the said high pressure. Today, an Ozone Health Watch is in effect as ozone levels are forecast to approach the federal health standard. For tomorrow, an Ozone High Pollution Advisory has been issued as ozone levels are expected to have the potential to exceed the standard. On Friday and Saturday, the high pressure pattern will weaken due to stronger winds expected to move over Arizona, but ozone is still forecast to be elevated. Then on Sunday, ozone levels are forecast to decrease as another low pressure system approaches Arizona from the Pacific Ocean. 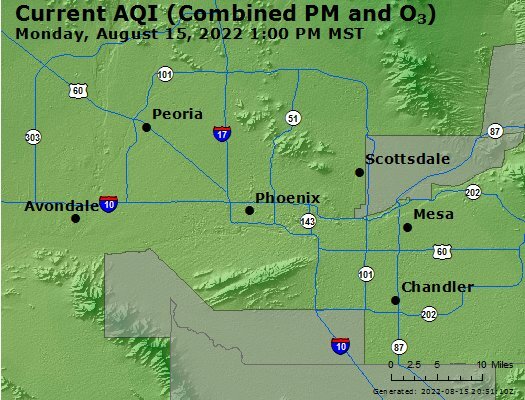 In regards to PM10 (dust), areas southwest of the Phoenix metro area will likely continue to see the highest levels of PM10 during the week, which may reach the Moderate Air Quality Index (AQI) category. Elsewhere around the Valley, however, should easily see PM10 remain in the Good AQI category.